The West Fork Trail is a pleasant 22-mile trail that snakes its way through a remote mountain setting and follows the West Fork River for most of its route. The soothing rumble of the river complements the trail’s serene environment. This is a great path for biking, but the surface is primarily ballast left over from the rail corridor, so leave your road bike at home. The trail begins in the small community of Glady. Even though the trail appears to be flat, you will find yourself on a gentle decline as the trail follows the river downstream from Glady. For the first 5 miles, the trail takes a higher route above the western side of the river and pops in and out of small groves of conifers, offering great views of the surrounding hills. It also intersects with other hiking trails within the forest, including the High Falls Trail (good for your waterfall fix). The West Fork Trail then levels out with the river and travels the remaining 17 miles to the town of Durbin following the river southward. Meandering through the mountains, the trail and the river make sweeping 180-degree turns through a tight valley surrounded by steep hillsides. The West Fork River is a popular fishing spot, and you are bound to see a number of anglers along the way. The trail comes to an end in the town of Durbin, a quiet Appalachian town that has wonderful little lunch spots and a nice Main Street corridor. There is a bonus rail-trail nearly a mile long, the Widney Park Rail-Trail, which can be accessed downtown. In Durbin, one can also catch the Durbin Rocket Excursion Train, an antique steam locomotive that offers beautiful views of the mountains and Greenbrier River in the Monongahela National Forest. You can pick up another scenic rail-trail south of Durbin in the community of Cass. 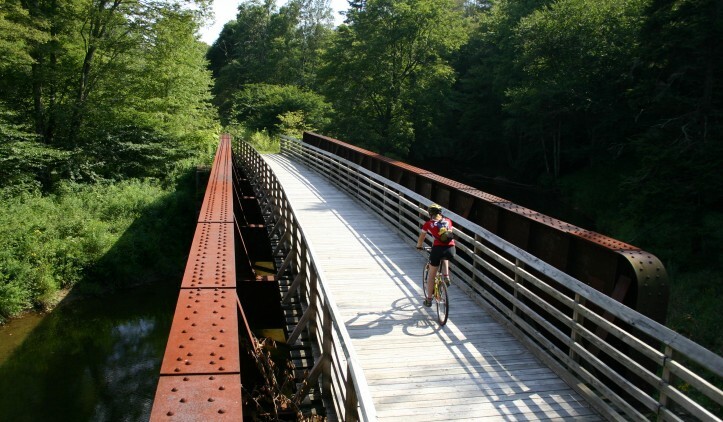 Here, you find the Greenbrier River Trail, which winds 77 miles southward through the lush river valley and is in the Rail-Trail Hall of Fame. Open for hiking horseback and mountain bike use; Please call the Forest Supervisor’s office in Elkins (304) 636-1800 for more information. To reach the northern trail head from Elkins, take US 33 east and make a right onto County Road 27 (Glady Road). Follow it for approximately 10 miles to the town of Glady. When you come to the intersection of Glady and Elliots roads, continue straight on Glady through the stop sign and follow the road for approximately 0.25 mile to where it dead-ends. The trail head will be directly in front of you. To reach the southern trail head from Elkins, take US 219 south to Huttonsville. Merge onto US 250 going south and follow it all the way to Durbin. Look for the trail head on the left about 1 mile before you reach the town.